Before I left for our VA vacation I went on a crafty spree. I showed a preview of Abby's birthday shirt and here's the finished product. I love it! 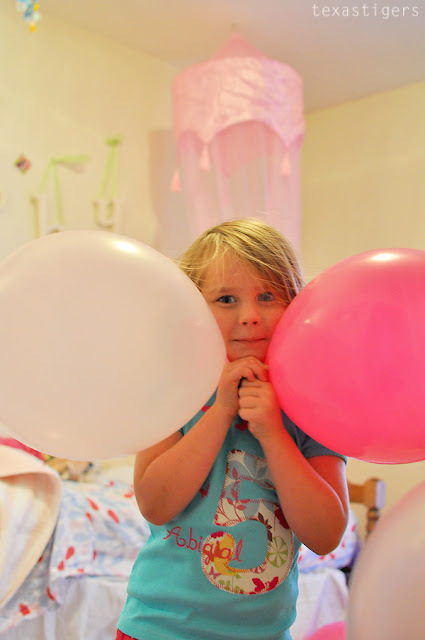 You may have noticed Abby wearing it in her birthday post. 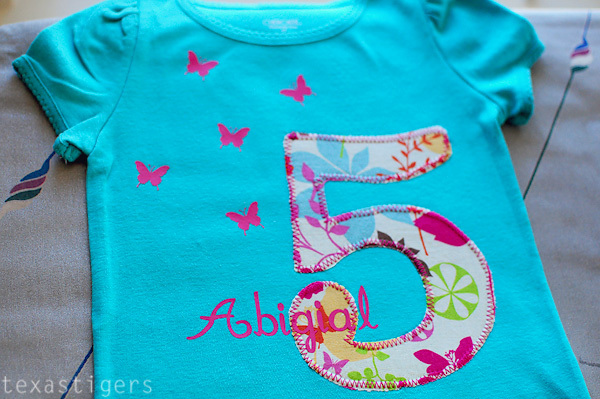 Then once the 5 was stitched on I cut out butterflies and Abigail out of pink heat transfer vinyl and ironed it onto the shirt. Easy! I'm quite impressed. I've used the printable heat transfer sheets before and they just don't hold up. This however is holding up well! I'm so thrilled because Abby loves her shirt and wore it not only on her birthday but also the next day as well. So far all the heat transfer is still looking brand new which is a lot longer than the printable stuff lasts - as that crackles almost immediately upon putting the shirt on! Now I'm going to need more colors to do more shirts! Maybe a sewing machine too or else my friend might not be so happy to help if I make too many shirts for her to sew ha! I love the silhouette! It made making this super easy! The part that took the longest was picking out the font for the name and 5 as you can use any font you have loaded on the computer and I have a lot to pick from! Of course they had to go and pull an "Apple" and come out with a new product that you "need" to have even though what you have works just fine and you love it. They have a new 12 inch cutter (the SD I have is 9 inch I think.) They also now have fabric ink and stencil vinyl which looks very cool! I need a big section in my budget now for craft supplies ha! That shirt is adorable, and its a great idea for birthdays.